The Piedmont Triad cities of Greensboro, Winston-Salem, and High Point offer wonderful lifestyles for active adult homebuyers looking in Central North Carolina. While many 55+ communities in North Carolina are located in the Charlotte and Raleigh-Durham areas, there are plenty of low-maintenance neighborhoods near Greensboro and Winston-Salem. Whether you are looking for a lock-and-leave condo, attached townhome, or ranch-style single-family home, you ll be sure to find a home to downsize or for retirement. Baby Boomers and retirees will never run out of things to do and places to see while owning a home within one of the Piedmont Triad active adult communities. There are a variety of festivals, towns rich in history, plenty of golf courses, restaurants, wineries, shopping options, and more. Greensboro and Winston-Salem active adult communities fall within the Piedmont plateau region. The entire Piedmont plateau stretches from New Jersey to central Alabama. Not to be confused with the Triangle region of Raleigh-Durham-Chapel Hill, the Triad cities are Greensboro, Winston-Salem, and High Point. This metropolitan area is divided into 12 counties set among the rolling hills of the Piedmont plateau. In terms of climate, active adult communities in Greensboro and Winston-Salem are located in a region that has a humid subtropical climate with four seasons. Summers are hot and humid while winters are cold. The average high temperature ranges from the high 80s in the summer and low 50s in the winter. Whether you are a history buff, outdoor adventurer, food and wine enthusiast, sports fan, or social butterfly, living within one of Central North Carolina s active adult communities provides you with limitless options for entertainment. Greensboro is home to 135 attractions and more than 500 restaurants. Popular attractions in Greensboro includes the Greensboro Historical Museum, Guilford Courthouse National Military Park, Greensboro Science Center, International Civil Rights Center & Museum, The Bog Garden, and more. Downtown Greensboro is a vibrant area that hosts a mix of shops, restaurants, festivals, parks, and a wide range of activities. Winston-Salem has an array of art galleries and unique shops. With more than 35 wineries and extensive list of restaurants you ll be sure to experience new cuisines and please your taste buds. The North Carolina Wine Festival is held in downtown Winston-Salem as well as a calendar filled with celebrations like the RiverRun International Film Festival. Nearby, active adult communities in Asheboro are located near plenty of outdoor attractions like the Birkhead Mountains Wilderness Area and area golf courses. The cost of living in North Carolina is lower than the national average. Real estate taxes are collected at the county level and income tax is collected at a flat rate of 5.8%. North Carolina does not tax Social Security income and there is no estate tax. 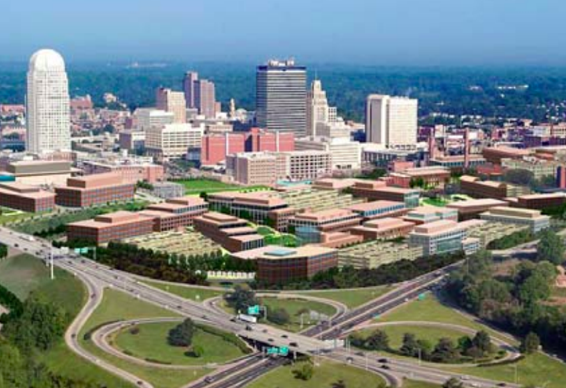 Active retirement communities in Winston-Salem have access to a nationally ranked hospital, Wake Forest Baptist Medical Center, and Novant Health Forsyth Medical Center, a high-performing hospital. Two other high-performing healthcare options are available at Moses H. Cone Memorial Hospital in Greensboro and High Point Regional Hospital in High Point. Those who live in active adult communities in the Triad cities will understand why North Carolina ranks high in personal satisfaction and fulfillment.